MIRAMICHI – For the most part, this is the last week of the season with Sunday, October being the final day of 2017 for salmon. Exceptions are the Bartibog, Tabusintac and Burnt Church Rivers which close October 29. So a big THANK YOU to all my sources for their reports this season. Rain on Sunday/Monday of this week has given rivers a little bump in water height which seems to be bringing in more fish and getting those pooled up on the move. Thus we should have a decent finish to the season. REMINDER: Striped season closes October 31 with a limit of two keepers a day between 50-65 centimeters. W. W. Doak and Sons in Doaktown said it has been a pretty good week. The Doaktown area had a foot plus raise in water, with down river getting probably two feet. This has stimulated the Salmon to move and has improved the catching. One angler had three grilse and a salmon on Monday and another salmon. Tuesday was a tad slower as the water had not crested yet, but the end of the season should have perfect conditions for a last kick at the can. Flies of choice were Ally’s Shrimps, General Practitioners, LT Specials, Copper Killers. Cains Coppers, Same-Thing-Murrays and Green Machines. Andrew Anthony of Ledges Inn in Doaktown and Mountain Channel in the Rapids area said they received about a two-foot raise in water which really got fish moving and virtually every pool had fish in it. They had been doing well prior to the rain, but Tuesday was slow, but he felt as the river began to drop Wednesday, they should have great fishing until season’s end. Mountain Channel also had been doing well, but the water was a bit high there at the moment. Both spots were seeing fresh fish with sea lice. He felt the Cains would also fish well to Sunday. Flies of choice were Purple &pink Marabous, Green Slimes, General Practitioners and Ally’s Shrimps. Herb Barry Sr. of Herb’s Fly Shop on the Station Road in Blackville said the weekend rain brought the river up and fish were moving. Anglers were seeing fish and catching some. Temperatures were good. Flies of choice were General Practitioners, Green General Practitioners, and Tippet Shrimps. Anglers at Quarryville Wednesday morning. Photo by Elaine Gray. Curtis Miramichi River Outfitting in Blackville said there were good numbers of fresh moving through the system and anglers were catching some. Quarryville and Gray Rapids were producing. The water had come up at least a foot and the temperatures were good. Anglers had caught about 40 striped bass around Gray Rapids, some a pretty good size. Flies of choice were General Practitioners, Ally’s Shrimps, Steve’s Specials, LT Specials, Yum Yums and Green Machines. Jim Laws of Miramichi Hunting and Fishing in Newcastle, Miramichi reported a decent raise in water which got the fish moving. Anglers were seeing a lot and catching some, but they were not taking as well as most would hope. The striped bass were moving about in schools making fishing a bit spotty. The better fishing was down river, and bait was having the most success. Flies of choice were Bombers and traditional Fall patterns. 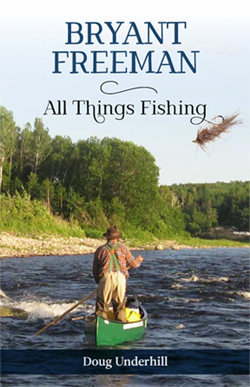 Syd Matchett of Trout Brook Fly Shop on the Northwest Miramichi said there were a few fish around after the weekend rain, and some fresh.Paul Elson caught a salmon, and there were reports of several more. The water had come up some, but still was very low, but a good temperature. Flies of choice were General Practitioners and Marabous, along with small Shady Ladies and Green Machines on nos.8 & 10 hooks. Debbie Norton of Upper Oxbow Outdoor Adventures on the Little Southwest Miramichi said they were having another good week. Roger Earle of Rhode Island had caught two salmon, Ken Dugas of Florida had two salmon and two grilse, Bourque Regan of Florida had two salmon and two grilse, Andy Dumaine of Massachusetts had two salmon and two grilse and Jeff Hall of Ontario landed four fish during his stay. The fish were sporting their Fall colours, but were not taking well although good numbers were being seen. They had about a five-inch raise in water and temperatures were good. Norton said that this has been her best Fall in three years. Flies of choice were mostly Green Machines. So with season’s end on Sunday, this is the last chance to get out for salmon and grilse on most of the rivers, so get out and “on the water”. There has been good news out of Norway with eight rivers cleared of an invasive species deadly to Atlantic salmon. 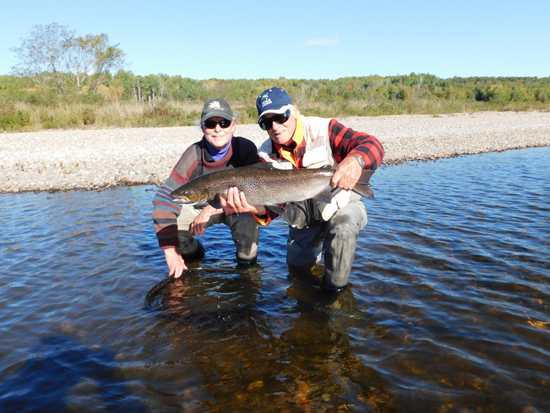 Plus, signs of improved fishing in NB, and the end of season in Quebec. For the first time, zero wild Atlantic salmon have returned to the Magaguadavic River, while escaped farm salmon continue to climb the fish ladder. Salmon sculptures decorated by local artists will be going up in a number of locations around Saint John in the near future. Leo White of the Coalition for Aquaculture Reform describes some of the shortcomings of the plan touted by the NL Premier Ball. Norway has eliminated an invasive species from eight of its salmon rivers, and they will again be open to anglers next season. A ban was considered but then set aside for further study. The debate follows concerns after the Washington State escape, and continued First Nations opposition to aquaculture in BC. The repercussions continue from the massive Cooke Aquaculture salmon spill in Washington State. This is a syndicated post. You can view the original post here: Miramichi Fishing Report for Thursday, October 12, 2017.